Lookit here... a blog post! Ok, it's only been 5 days but it feels like 5 1/2. But as you know, I've been a little preoccupied this week and just plain ol' wasn't in a very good mood. Fortunately, those of you who are friends of mine on Facebook know that I had an awesome night last night which helped tremendously to bring me out of my funk. My band, The Receders, played to another sold out house at the Pioneer Place Theatre and it was an amazing night. The crowd was totally energized and the dance floor was packed all night - well, except for the 7 minutes we played Do You Feel Like I Do. Uh...that's not exactly a dance song. The interesting thing about playing in a theatre is that sometimes they are already set up for a play. When this happens, it's impossible for them to take the whole set apart - so the band has to perform right there amongst the set. In our case, the play was about a fishing cabin. 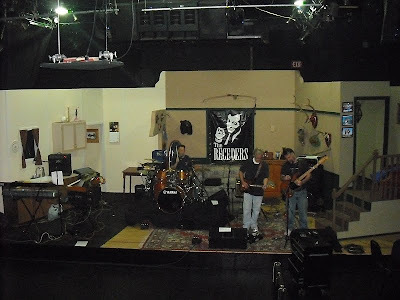 As you can see in the picture I took during our sound check, my keyboards were set up in the kitchen and the rest of the band was playing in the living room. I have to say this was by far the most unique stage I've ever performed on. Besides having an awesome night with all of our fans, I was also the subject of a huge surprise. Over the last month, my lying scumbag of a very clever wife has been scamming me by secretly organizing a reunion of a group of my oldest friends - including two of the bandmates from Livingston Fury, the band I was in through most of the 80s. Here they are (the lead singer and guitar player) in a video that one of the other friends that was here last night took of us in 1987. So yes... I am feeling better and most likely will get back on my blog horse again now. I just needed a few days to process the shock of being laid off. And thanks to a great time with my band, good friends from the past and the covert double-crossing antics of my spouse, I am officially good to go! Ummm, honey did you forget that potential employers often google candidates for jobs names before hiring them? Ummm, that mere fact that at one time in your life you had such poor judgment as to have hair like that could potentially end any job offers coming your way. I think I better figure out that grocery bill based off unemployment again....this could be a long haul. And by the way, all the organizing was done by your lying friends and not your clever wife! All I had to do was lie to you which was quite enjoyable! Glad to see you back on your blog horse. :) You will pull through this, I have no doubt. You have a great group of friends...and family, especially your wife, as seen by her response. Jeff, I'm glad you're feeling so good. I have to say, I'm feeling pretty good too after seeing you in that video. Your hair, it just makes me smile. Ya know? I wouldn't worry about the hair, Charli. They can tell that that won't be a problem anymore. Jeff, if we hadn't planned this trip to Arizona six months ago, I totally would have been there for your concert. Let me know when the next one is! charli - Let's see... I had the poor judgment to wear hair like that, yet you fell in love with me (hair included). Got it! unfinished rambler - Amen. They truly are the bestest friends you could ever ask for. debra - Thanks. And yes... Charli DID seem to derive some perverse pleasure from scamming me. At least I know how to make her happy. mom thumb - Yeah, it would have been a blast to see you. And don't worry... I won't stop advertising these events. Oh, man, thanks for posting that video. I needed a laugh today. And I love your stage. That's hilarious. So glad you're in better spirits. I know things are looking up for you. Oh, Charli. Don't you know they'd hire him because of the hair? Glad you had such an awesome night, Jeff. Sounds like a view from Cloud 9! I realize it was the 80's and all, but did Wally do his shopping at Barnum and Bailey's? Glad you had such a good time! How long had it been since you'd see some of your firneds?? I feel bad, I shouldn't pick on Wally. Sorry, but you all look like freaks. Thirty years from now when you look back at the Receders, do you think you will all look so bizzare? 1. I love 80's music, since it was the decade of my teenager-osity. I love anything that even remotely sounds like 80's music. This video was no exception! Good stuff. I'd buy the album, the cassette, the CD, or whatever the young folks are calling it these days. 2. O M G. The hair. The HAIR!!! jd - Me too. Now I just need to get me one of them there job things. Can you buy them at Walmart? kathy - Funny you should mention that. I used to work at a restaurant called Cloud 9 as a teenager. And it was a great job with a fabulous view! rick - I asked a similar question last night when we were hanging out with Wally, Nancy and a bunch of our friends looking at old pics. Where on earth did we FIND these clothes? elizabeth - It's been years since I've seen these guys, but when we get together it feels just like yesterday. rick - Oh, you ain't seen nothing yet! We spent 6 hours yesterday sharing and scanning our old photo albums. Be afraid... be VERY afraid! janna - Happy Birthday! And for being one of my favorite bloggers, I am going to send you a Livingston Fury CD for your birthday. But you must promise to wear spandex pants and leg warmers when you listen to it. Awesome Jeff! It doesn't surprise me at all you are in better spirits so soon... you're such a positive person. Oh how fun. I love the stage you're in. That's too cool and I'm sure made for an interesting night. Glad you've got some happy things going on. Good luck on the search! This is a great blog you have here. I have a humor blog myself which I hope will bring laughter to everyone's day. I'd like to exchange links with you to help spread some traffic around between each other. Sounds like a great time! I will have to come see the band sometime. Glad you are back on the blog horse. maureen - Actually, it IS the last one. But I thought it was relevant so I posted it again. jason - Thanks for stopping by. :-) I kinda quit doing the blogroll exchange thing a long time ago. I still have an old blogroll up but I'm not even sure if some of the blogs on there even exist any more! In fact, I'll probably just take it down soon. shw - That's right... you're from around these here parts, aren't you? Yes, please do stop by sometime. It would be awesome to meet you!